The HomePod is a Siri-powered speaker with powerful bass and killer features for iPhone users, but it has flawed “smart” functionality that falls short of its competitors. Amazon’s Echo took smart speakers mainstream, and less than three years after its debut, 1 in 6 (or 39 million) Americans own devices with Amazon or Google’s assistants on board. And now Apple’s take on the tech, the HomePod, is here. The HomePod is a voice-activated speaker with Siri built in that can stream songs from Apple Music via spoken commands. Songs from other streaming services can be played only through AirPlay, a wireless audio technology available exclusively on devices made by Apple. In other words, the HomePod, available on Feb. 9 in the US, the UK, and Australia, might be the Apple-iest Apple device in recent history. I’ve been living with, listening to, and shouting at the $349 plump music machine for a week — I've found that the HomePod is a good-sounding speaker with killer features for iPhone users, but it has flawed “smart” functionality that falls short of its closest competitors, and for a much steeper price. Android users beware: If you don’t have an Apple Music subscription, an extensive iTunes library, or an iPhone, you shouldn’t get the HomePod. You need an iPhone or iPad to set the HomePod up. Furthermore, the only streaming service you can control with your voice on the HomePod is Apple Music. (A subscription costs $10 per month for individuals and $15 per month for a six-person family.) Voice control also works with purchased iTunes music, free podcasts, and Beats 1 radio, which doesn’t require an Apple Music subscription. You can play Spotify and other audio from your iPhone or Mac via AirPlay, but you won’t be able to use your voice — and voice control is the main appeal of a smart speaker like the HomePod. Here's what the HomePod via AirPlay on Spotify looks like. The HomePod is called "Living Room." Siri hasn’t had a great reputation on the iPhone, but it’s much better on the HomePod. The HomePod comes, of course, with Apple’s voice assistant Siri built in. I found the speaker to be exceptionally good at hearing the wake phrase (“Hey Siri,” just like on an iPhone) and at understanding what I was saying. Siri could hear me while I was wearing my retainers (“Hayy Sheeree, remind me teh bring mah headphonez toomerow”), brushing my teeth, or cooking with the overhead vent turned on. Best of all, Siri knew what I meant when I said, “Play SZA” (!!! ), pronounced “sizza.” Alexa plays John Philip Sousa or Sizzla instead. You’d think the most nominated female artist of the year would have earned some more RESPECT from the most popular chatty speaker bot. I thought saying “Hey Siri” around both my iPhone and HomePod would be a nightmare (“OK Google” almost always activated my boyfriend’s Google Pixel and our Google Home at the same time). But it wasn’t: The iPhone is attention-aware and can tell when you’re looking at it to determine which Siri you’re talking to. Other unique HomePod features include allowing podfasters to play podcasts at 1.5 times or double the normal speed (Alexa can’t). You can use your voice to send iMessages, SMS texts, and even third-party WhatsApp messages (which, BTW, is one of my favorite features), as long as the connected iPhone is on the same network. Siri on HomePod can also set reminders using the iPhone’s Reminders app and transcribe notes in the Notes app. Having lived in a Google Home household, with plenty of features for Android phones and relatively few for iOS devices, I found the HomePod’s native iPhone integration felt like sweet victory. But the HomePod lacks some of the basic “smart” features that Amazon Echo and Google Home have long had. If you live in a shared household, you can’t switch profiles to take advantage of Apple Music’s personalized playlist features, or access different accounts’ reminders, notes, or messages, which are what Apple calls “Personal Requests.” Both Amazon and Google’s devices can recognize different people’s voices and automatically switch to their profiles. The HomePod can’t do this. FYI: Personal Requests are optional. They only work when the connected iPhone is on the same Wi-Fi network as the HomePod. So, no — no one can listen to your unread text messages or send them on your behalf while you’re away. Also, the HomePod has no calendar support. Hearing all of my day’s meetings and appointments is a feature I’ve loved on both the Google Home and the Echo. 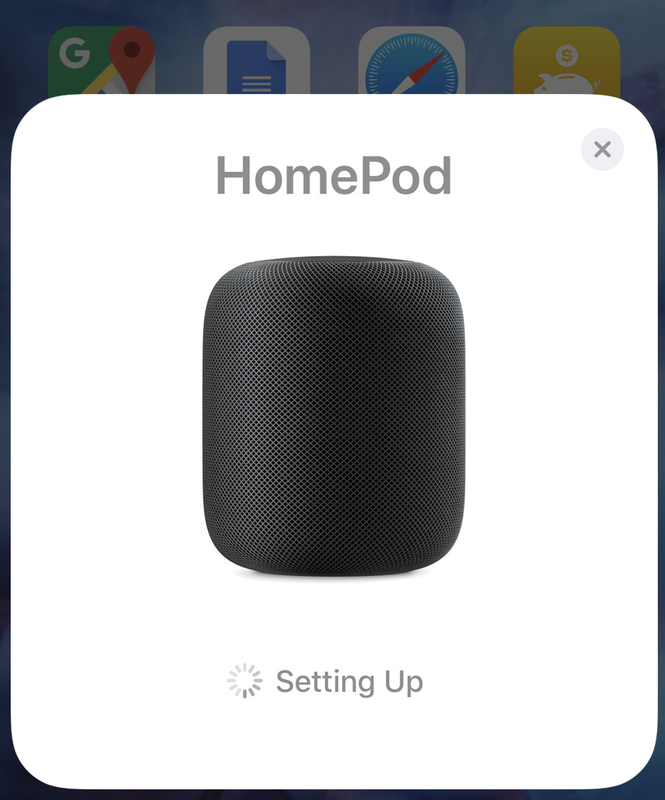 You can access the HomePod’s settings from the Home app (which you probably didn’t know existed on your phone). But there isn’t much there. You can’t set your news source (which has to be done with your voice), or change the alarm tone. You can’t see a history of everything you’ve asked the HomePod, like you can with other smart speakers, which, depending on your stance on privacy, may be a good thing. 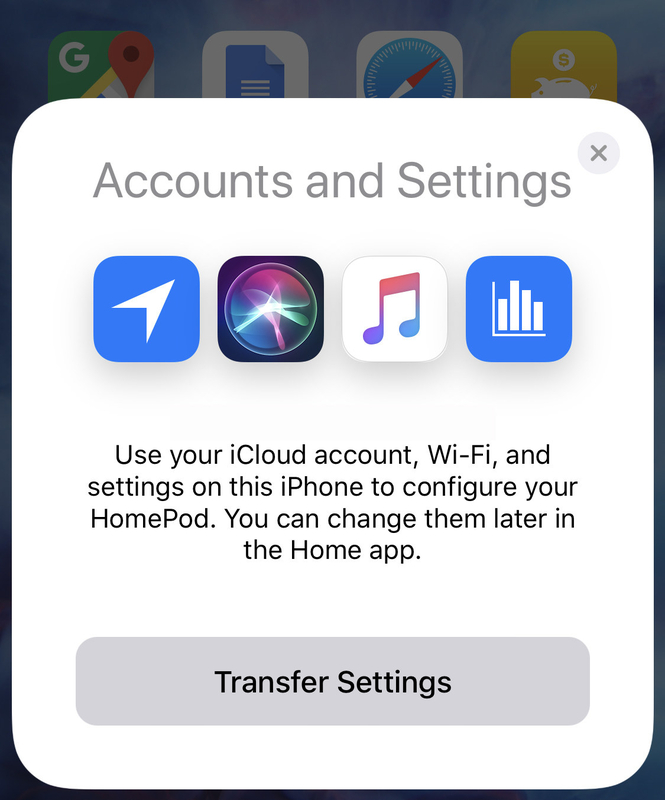 If you live in a shared household, you can’t switch profiles to take advantage of Apple Music’s personalized playlist features, or access different accounts’ reminders, notes, or messages. Apple doesn’t care about activity history in the same way that Google and Amazon do. Unlike its competitors, Apple doesn’t store queries. If the government asks for your HomePod data, Apple wouldn’t be able to give it to them, because it doesn’t have it. Siri’s ability to understand commands is also limited. For denoting musical preference, “I don’t like this” doesn’t work, while “I don’t like this song” does. Siri also didn’t know when pomegranates were in season (October through January), and neither did Alexa, but Google Assistant prevailed. Siri also won't swear — even if you allow explicit content. The HomePod is incredibly easy to set up. I didn’t need to type a single thing. I just held my iPhone close to the HomePod to transfer the Wi-Fi network name and password, as well as my Apple ID credentials. It’s nice seeing the AirPods’ stupid-easy automatic pairing interface working on other Apple products. It’s much easier to move the HomePod around and set it up on new networks, too. When you plug in your HomePod in a new place, the speaker grabs the Wi-Fi password from your phone, and it can be used immediately without additional setup. Sonos, a competing speaker system aimed at audiophiles, is a setup nightmare. When I brought the two speakers to my office, I had to go through all of these hoops, including factory-resetting the device, only to find out that it couldn’t connect to the building’s non-2.5 Ghz network. The HomePod comes in two colors: marshmallow (white) and charred marshmallow (space gray). It’s one of the heftiest pineapple-sized things I’ve ever picked up (5.5 pounds). This question is very different from the question the Amazon Echo and Google Home are trying to address. 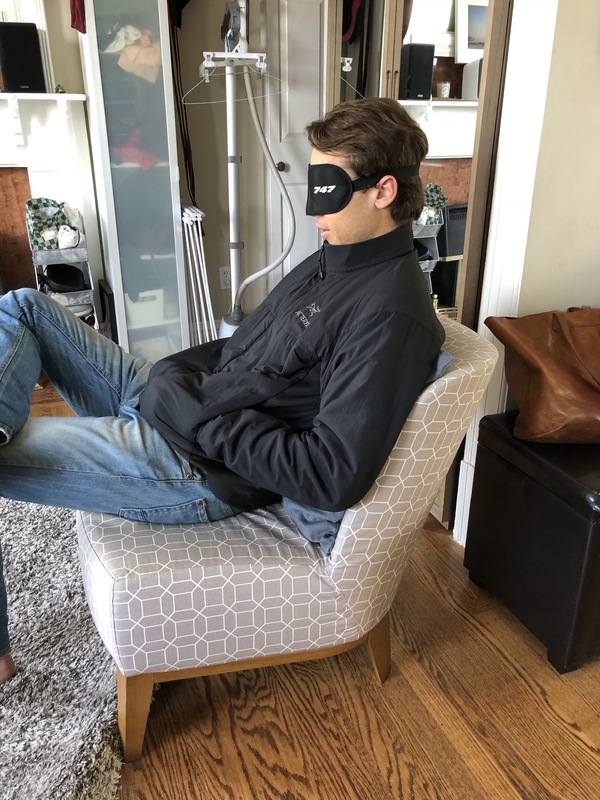 Those speakers’ primary aim is to offer hands-free help, by way of turning on the lights in the living room, telling you what traffic to work is like, setting timers, and playing podcasts while you’re busy cooking breakfast. The HomePod can do all of those things (with varying degrees of success) — but what it *really* hopes to be is a speaker that sounds really good. 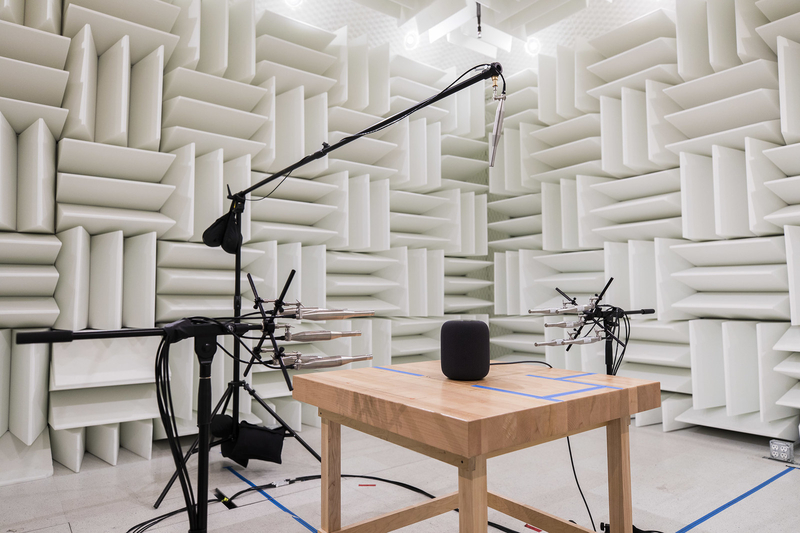 That’s why Apple showed us (the bloggers) its lab full of large anechoic chambers, rooms built on isolating springs to keep vibrations from the outside world out. The company wanted to prove it’s serious about audio quality. “You have to really want to do this,” said senior director of audio engineering Gary Geaves, as he waved us onto a wire trampoline suspended above giant, asymmetrically directed spikes of different sizes. 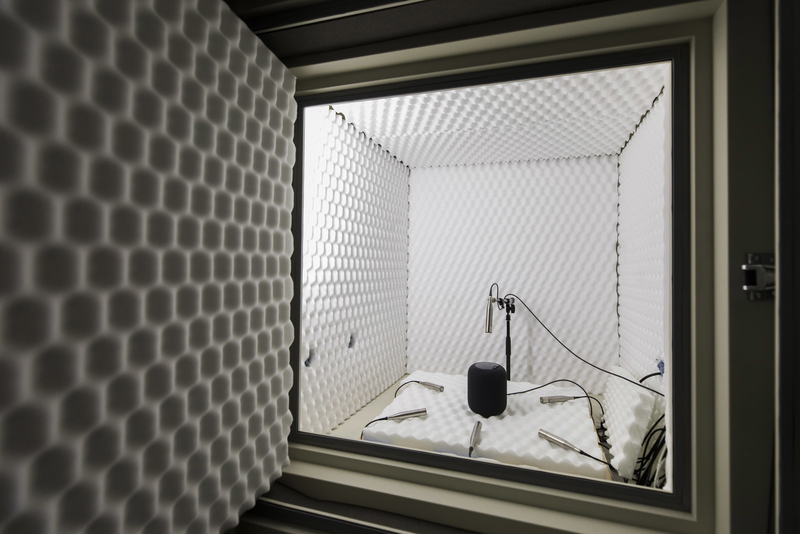 Apple's anechoic chamber where the speaker array was developed. The chamber, which was seemingly covered, floor-to-ceiling, in Chuckie’s hair from Rugrats, would be terrifying if not for the fact that the spikes are made of a soft, styrofoam-esque material. Apple wouldn’t show us how testing in the room worked. Geaves asked us to imagine that here, on this wire trampoline, is where Apple developed the “beam-forming speaker array” (human translation: high-frequency tweeter speakers) and the woofer that powers the HomePod’s powerful bass. Throughout my week of testing, I listened carefully to the HomePod to see what the result of all that testing was, and I had a few colleagues do the same. What I — and a few others — found was that HomePod was more spatially aware than other speakers we listened to. In fact, it has a microphone on board to listen to its surroundings and adjust its sound settings accordingly, as well as an accelerometer to detect when it's been moved, which will prompt the speaker to refresh its tuning. The Sonos One, which has Amazon Alexa built in, and Apple’s HomePod are natural competitors. Both tout themselves as premium audio offerings in the smart speaker category, in contrast to the cheap, tinny speakers that have kept the Amazon Echo and Google Home affordable and accessible. 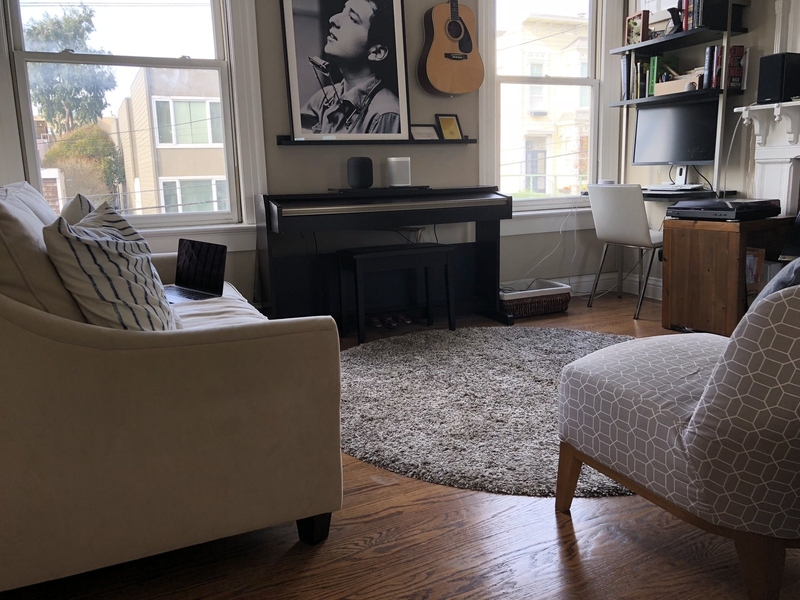 I compared the HomePod with the Sonos One in the living room of my small one-bedroom apartment, and then in BuzzFeed San Francisco’s 650-square-foot lab with ~15-foot-high ceilings. In a blind listening test in my apartment, my BF Will overwhelmingly preferred the Sonos One, saying “the vocals are really more clear on the Sonos” for the Grateful Dead’s “China Cat Sunflower”; that the Sonos’s “mid-range sounds more prevalent” and “accurate” for Lorde’s “Green Light”; but that there was “more detail” on the HomePod for “God’s Plan” by Drake. I mostly agreed — except I thought the HomePod spread audio throughout the room more evenly than the Sonos One, which fired audio in one direction, rather than filling the space. I listened to Rhye’s new Blood album, and the bass felt too thump-y on the HomePod, but the bass guitar sounded great. Yaeji’s “Passionfruit” also sounded better on the HomePod, which really highlighted the record’s ethereal/atmospheric vibes. The Sonos made Laura Marling’s voice on “Ghosts” and “Rambling Man” sound especially clear, like she was in the room with me, but the HomePod gave the tracks a warmer tone overall. In the BuzzFeed lab, a challenging room for any speaker, the large, echoey space swallowed the Sonos’s sound. My editor John Paczkowski, a metalhead, described the Sonos’s audio as “thin” compared with the HomePod, which it definitely was, especially at louder volumes. Neither speaker did a particularly good job of playing Paczkowski's picks: Yob’s “Prepare the Ground,” which sounded muddy, and Black Sabbath’s “Paranoid.” But HomePod "destroyed" channeling Monolord's "Audhumbla" and its from-the-bowels-the-earth bass. Paczkowski also liked the way the bass was rendered by the HomePod in “Comfortably Numb” by Pink Floyd and thought the Apple speaker did a better job with Superorganism’s “Something for Your M.I.N.D.,” compared with the Sonos One. The takeaway from our tests is that Sonos speakers sound calibrated to pay deep attention to everything — every guitar strum, every bass line, every hi-hat tap — because, perhaps, they’re aimed at a very particular type of music listener. The HomePod has a very thump-y bass, with an algorithm on board that looks ahead at the track’s next 30 milliseconds and tunes frequencies in real time. If you love EDM, hip-hop, and other bass-forward music genres, this treatment sounds amazing, like you’re at a live show but without lasers and strobes pointed straight at your eyeballs. But if you don't, there are unfortunately no equalizer settings on the HomePod you can adjust to peel back the bass for your ears' and neighbors' sake (sorry to my neighbors). It’s important to note, though, that while the HomePod may not be great at always distinctly separating the mid-range, Apple's speaker is much better at understanding a room’s space and making a song sound BIG and EVERYWHERE. Advanced audiophiles, though, will most likely want a stereo setup with two or more speakers — but HomePods (two of which would cost you a cool $700) can’t be paired in stereo mode yet. Apple says that feature is coming later this year, but it didn’t indicate exactly when. Ultimately, none of this is a hard science, and audio preferences are highly subjective. The HomePod set out to be “a breakthrough speaker” compared to others, but reactions to its audio quality from the four people who listened to it for this review — tech editor John Paczkowski, my editor Sam Oltman, my boyfriend Will, and myself — were mixed. The HomePod outperformed other speakers in some situations and not others, but all agree: It absolutely sounds better than the small speakers aboard the Amazon Echo and Google Home. TL;DR: Should I buy this? The HomePod is designed for someone with 100% Apple product buy-in, who lives in the iOS/Mac ecosystem, who subscribes to Apple Music, and who just wants basic smart speaker features. If you tick all of those boxes, and want a plug-and-play internet-connected speaker that sounds good and requires minimal setup/customization, the HomePod is for you. Anyone else should consider other options. The HomePod is a hard sell when you consider the price and flexibility of its competitors. I have some fundamental issues with the $200 Sonos One, which sounds great, but often feels like a second-class citizen in the Alexa universe. (You can’t change the One's wake word, wrong words trigger it, and there's a super-frustrating bug where you can’t pause it with your voice.) If you have an existing Sonos system at-home, I’d get an Amazon Echo and use the Sonos skill instead of buying the One. Amazon’s voice assistant Alexa is, in many ways, more mature and capable than the HomePod’s Siri. The $115 Echo Spot has a very compelling, small, round display that can show you album art or lyrics, among many other things. When paired with existing Sonos devices or a home stereo system via audio jack, it could be the right solution for someone who wants a voice-activated speaker and high-quality sound. For most people, I still think the original Google Home, with a Chromecast Audio connected to a set of bookshelf speakers or top-notch monitors, is the most cost-effective way to get kickass sound all over your home. Not to mention, Google Assistant is the best at answering questions. It was the only bot that knew when pomegranates were in season. A few years ago, I was staring at a friend’s Amazon Echo, wondering who, if anyone, was listening on the other side. Someone in the next room declared, “Nah, Alexa’s too creepy,” prompting the Echo’s aurora to flash at the sound of her name. Months later, I tried the voice-activated speaker myself, and became convinced: Chatty at-home bots that eliminate the unpleasantries of having to tap, tap, swipe are the future.